Niagara Falls, with a little extra! 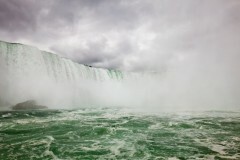 I’ve just returned from a fantastic trip to Niagara Falls. I say returned – I’m actually still in Canada and back at Mont Tremblant (and have actually dashed in to write this post while the rain falls which has scared away the chipmunks I’m watching at play today). The picture doesn’t need any introduction really. It’s fireworks. Above Niagara Falls. The falls you actually see on the right hand side are the American Falls, while at the far right in fetching purple and orange is the smaller Bridal Falls which anywhere else would still be pretty significant and impressive waterfalls. The iconic Horseshoe Falls are just a little further along the river towards us out of shot. To the left of the image is Canada and the town of Niagara Falls, whereas to the right is the United States. Despite being fairly widely traveled, I’ve still never visited, but this is the closest I’ve ever got and we were tempted had it not been for the likely delay at the border. I also have a 6,000 image 16 hour timelapse of the falls started at 5pm on the night of our arrival, but assembling that will need to wait until I get home to the UK. In the meantime, I hope the fireworks brighten up your day! Posted on Wednesday, June 6th, 2012 at 7:45 pm. 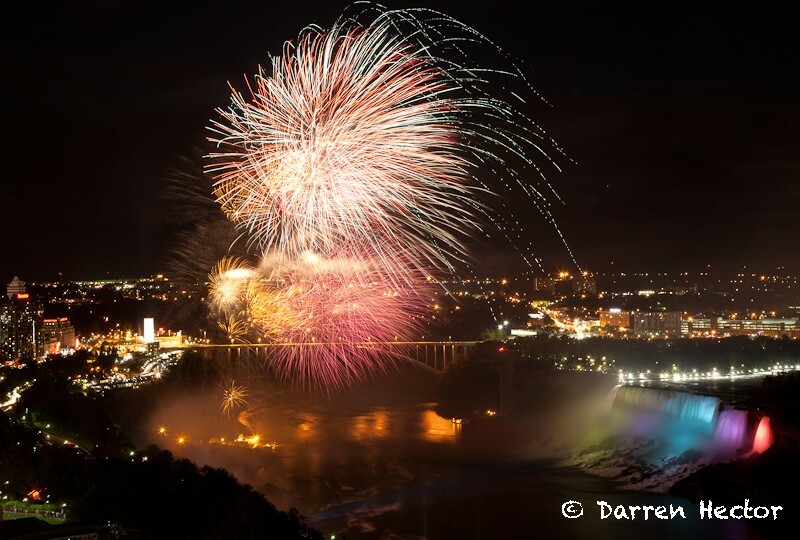 Filed under: Landscapes Tags: America, American Falls, Bridal Falls, bridge, Canada, fireworks, Lake Erie, Lake Ontario, Niagara, Niagara Falls, river, United States, water	RSS 2.0 feed. Fantastic photo Darren!! Love it!! That is an absolutely superb capture! I’ve missed your pics SO MUCH! Thanks both. I quite like it too. Some daylight pics of the falls coming up too.